Pierce Brosnan has made little use of his stardom since serving his time as James Bond; only Richard Shepard's offbeat hit-man thriller The Matador made something interesting of his saturnine charm. Veteran director Roger Donaldson (Dante's Peak, The Bank Job) would seem to be ideally placed to fashion a fresh franchise for Brosnan, but dim supporting work and muddled plotting make a series of November Man films an unappetising prospect. Based on Bill Granger's book There Are No Spies, the title The November Man refers to the deadly prowess of ex-CIA operative Devereaux (Brosnan); like the inhospitable autumnal month, he leaves nothing alive in his wake. Devereaux comes out of retirement to rescue an old flame with information about the previous atrocities of Russian political candidate Arkady Federov (Lazar Ristovski); this leads him to Alice (Bond girl Olga Kurylenko), who has her own personal reasons for wanting revenge on Federov. The two spies team up, but standing in their way is current CIA agent Mason (Luke Bracey), still smarting from a fatal accident he caused while working as protégé to Devereaux. Generic is the word for such laboured deceptions: Donaldson makes little of his Moscow and Belgrade locations, and alternates talking-head TV flatness with silly sub-Bond action that would seem unrealistic in a video game, with Brosnan barely breaking a sweat as he races around mansions in a tailored suit, blowing holes in Federov’s supposedly elite security guards. Kurylenko gives a spirited performance in an underwritten role, but Bracey is a no-show in terms of acting or presence. 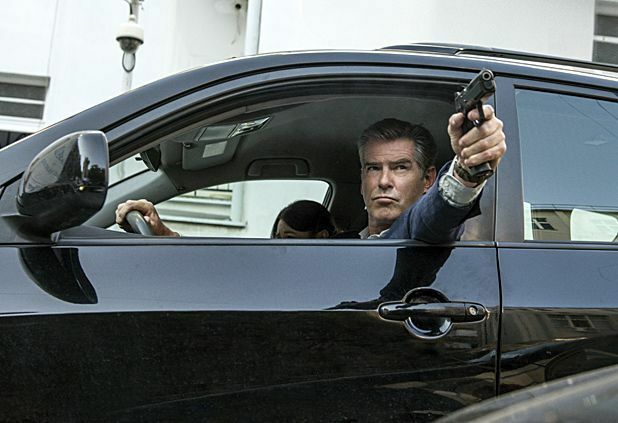 Despite's Brosnan's credit as an executive producer, The November Man is a half-hearted effort from a star whose interest in making a comeback seems somewhat lacking. Such lameness is all the more disappointing considering how much more tightly Donaldson once pulled together a similar package in the 1987 Kevin Costner spy drama No Way Out. Selected release from Fri 7 Nov.